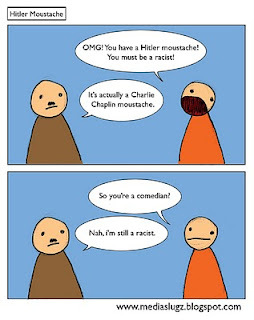 Just because someone has a Hitler moustache doesn’t mean they’re Hitler. In actual fact I think it’s called a toothbrush moustache so just because Hitler had a toothbrush moustache it doesn’t mean he was a tooth brush. It doesn’t mean that he wasn’t though….. hmmm it’s worth looking into. It certainly would explain a lot.